You must follow your carpet manufacturer's carpet cleaning and maintenance guidelines to the letter if you want to keep your new carpet warranty in force. You should hire a professional to clean your carpets every 12 to 18 months, or as required, whether you think your carpet is dirty or not. Always Keep All Your Original Carpet Cleaning Sales Receipts! You may be asked to show proof of professional carpet cleanings as required by your new carpet warranty. 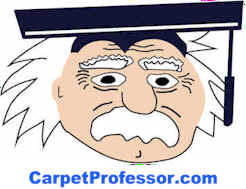 Read your carpet warranty and follow the carpet maintenance suggestions to the letter. This is how you can make sure your carpet lasts as long as possible! Spot clean as necessary and use approved carpet cleaning products. Make sure you know which warranties apply to your particular carpet. Warranties are usually posted on the backs of samples in the store at the time of purchase. It is your responsibility to know which warranties apply to your specific carpet and obtain a copy for your review and records. See How to find a qualified carpet installer. Maintain your carpet according to the manufacturer's warranty recommendations. Always keep every bill, invoice, or statement as proof of periodic cleaning by a Certified Carpet Cleaning Company. You must notify your carpet retailer in writing; describe your concerns and if possible provide photos or other documentation; include a copy of your sales invoice and receipts for required periodic professional cleanings. Your carpet retailer will usually initially investigate your claim and attempt to satisfy your concerns. If that is not sufficient, they may need to notify the original installer or the carpet manufacturer as they deem necessary to satisfy your complaint and try to determine who may responsible for your complaints and hopefully provide a satisfactory resolution to your concerns. In some cases you may have to contact the carpet manufacturer or carpet installer yourself to seek a remedy to your problems. Here is a List of Carpet Mill Websites and their phone numbers. Have you read your manufacturer's new carpet warranty? It's an eye opening experience! Every manufacturer has their carpet warranty worded a little bit different so be sure to read the full warranty for the carpet you are considering... before you buy. Not all carpet cleaning companies are created equal. Some are definitely more reputable than others and homeowners need to be careful who they hire. Costs can vary greatly and hiring the company with the lowest price may not be the smartest way to go. Watch out for carpet cleaning companies that have low-cost specials that sound too good to be true. Q. Should I Buy New Carpet or Have My Old Carpet Cleaned? The two organizations I trust are; The Institute of Inspection, Cleaning and Restoration Certification (IICRC), and The Carpet and Rug Institute (CRI). These are their seals of approval you should look for when looking for a reputable carpet cleaning company. Q. How many people live in your home? A. That's how many times you should vacuum each week, especially in high-traffic areas! Do you have four people living in your home? Then you should definitely own a newer more-powerful vacuum and vacuum your new carpet about four times a week! Some folks need to vacuum everyday! More people and more pets means more vacuuming for your new carpet. Want your carpet to last years longer? Then you should vacuum more often. Have allergies, COPD; Asthma or other upper-respiratory issues. Live in a moist or humid climate like Florida. This means you should be vacuuming practically everyday. But vacuuming everyday won't help if you don't have a good quality vacuum or if your vacuum is not operating at it's peak efficiency. If your vacuum is not doing a good enough job, the dirt that penetrates the nap of your carpet will begin grinding away at the fibers. This leads to dulling of the color and matting and crushing of the pile, which in turn makes your carpet look worn out faster. And once your carpet starts to lose it's shine and look dingy, nothing can be done to make it regain it's original like-new shiny appearance. There's more to maintaining your carpet than just dealing with the problem of grit, dirt and dust penetrating the nap of your carpet, small children and active teens can significantly increase the daily wear and tear on your carpets. Running, jumping, dancing, playing with hoola-hoops and other common busy activities are very damaging to the carpet pile. Rigorous activities grind and force dirt and abrasives deep into the nap, often too deep for older or less-powerful vacuums to remove. This is why having a good quality vacuum with enough suction power is so important. Abrasion is a main cause of carpet wear and tear. You can see the effects of abrasion most obvious on stairs, down the hallways or other high- traffic traffic lanes. Carpet fibers can only tolerate a certain amount of abrasion before they show the effects. While diligent vacuuming won't undo damage caused by active kids, it will help reduce the damaging effects by removing the majority of gritty abrasive sand-like dirt and debris. It's getting harder everyday to find an honest and reputable carpet dealer! That's why I put together my own special hand-picked list of Carpet Dealers who are locally owned, give free estimates, offer fair prices, have knowledgeable staff, provide honest measuring and use qualified and experienced installers.